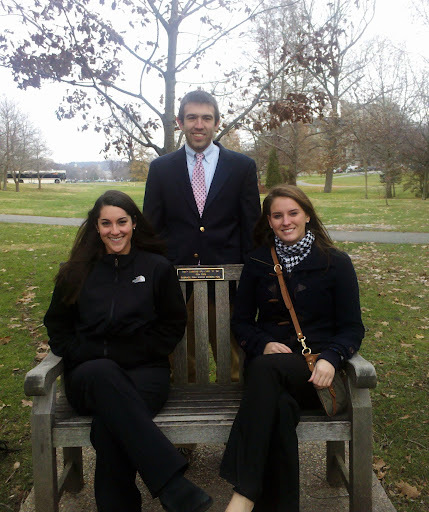 We proudly announce the 2011 recipients of the Emily C. Specchio Memorial Scholarship at Virginia Tech. This year we were able to fund the study abroad costs for FOUR students! All of the students will be studying abroad in Lugano, Switzerland this spring. Brandon is a Virginia Tech Junior double majoring in accounting and marketing. He is a brother of Pi Kappa Phi, and is involved in community service supporting PUSH America, Relay for Life, and the Special Olympics. Ashley is a Virginia Tech Junior majoring in Psychology with a Marketing cognate, and a member of the Alpha Phi sorority. She has spent 7 straight summers volunteering on mission trips to Sneedville, Tennessee and is also been involved in Relay for Life, Greeks Giving Back, and Our Neighbor’s Child. Emily is a Virginia Tech Junior honors student majoring in Communications with a minor in Political Science and a Marketing cognate. She is a member of the Zeta Tau Alpha fraternity. She traveled to Nicaragua over her last two spring breaks to work with orphans and refugees through the Nicaragua Orphan Fund. Jillian is a Virginia Tech Junior honors student majoring in Marketing Management with a minor in Business Leadership, and a member of the Delta Delta Delta sorority. She volunteers at Gilbert Linkous Elementary, tutors at Blacksburg Estates Mobile home park, Relay for Life, and Pamplin Ambassadors. For more photos of our trip to Virginia Tech to meet the recipients, check out our photo gallery here!